Kia ora my name is Shakaia and I think I would be a great inspiration in 2018. I want to be next years manaiakalani leader or head girl for Panmure bridge school. I know I have the potential of becoming a head student. I can do this by showing younger children what the expectation is as the future leaders of our school. I wear my school uniform with pride and I try to represent our school well. I think I would make a fantastic head student next year because I know I can strive harder to succeed. I am one who does not have much confidence but by becoming a leader of this school I will learn how to build confidence in myself. I want to strive for success for this role of being a head student. Respect,cooperation and encouragement are just some key points I have as a role model of our school. As a future year 8 of Panmure bridge school I can show that I can accomplish my goals. And I may just be a leader everyone will remember. Thank you for listening. 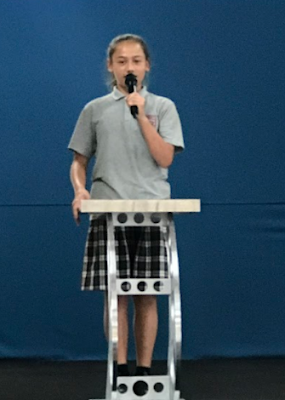 This afternoon I performed my speech in front of the whole class. I was very nervous and worried about how my words were going to come out. Shaking and afraid I got up on the stage and spoke. The nerves I had slowly faded away but they were still there. Speaking something I am not very great at doing, but I still tried my best and did what I could do. Everyone's speeches were interesting. I really wanted to vote for everyone that put themselves forward. This was a heart pounding experience but I still in someway had fun.